DFS was founded in 1969 with a single store near Doncaster and has since grown to become the clear market leader of upholstered furniture in the UK. Today DFS employs more than 3,500 people and operates over 100 retail stores in the UK, the Republic of Ireland and the Netherlands, a comprehensive online channel, and three upholstery factories in the UK. 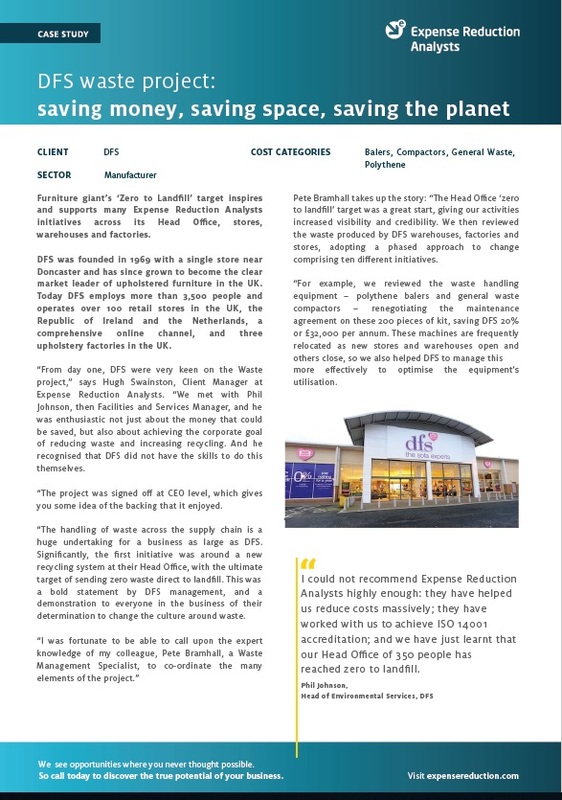 “From day one, DFS were very keen on the Waste project,” says Hugh Swainston, Client Manager at Expense Reduction Analysts. “We met with Phil Johnson, then Facilities and Services Manager, and he was enthusiastic not just about the money that could be saved, but also about achieving the corporate goal of reducing waste and increasing recycling. To find out more about how ERA helped DFS, including results, savings and more details from the client, download the full case study now.